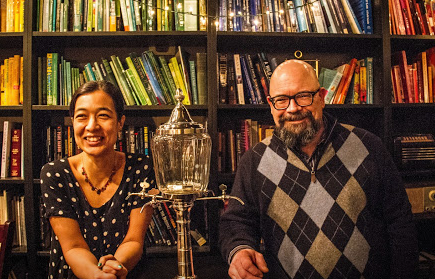 The folks behind the Reading Room, the bar-within-a-bar at Petworth Citizen focused on literary-themed cocktails, are celebrating the bar's one year anniversary tonight! There will be cocktails from the last year as well as champagne. In the past, Reading Room has held weekly events with cocktails based on a certain author -- this week's is Edgar Allen Poe on Oct. 22, for example. The drinks come from mixologists Chantal Tsung, Dan Searing and Carlie Steiner, and the events are a lot of fun. The room itself is neat too -- it's a little lending library with a bar in it. This week the Reading Room DC turns one! At this time last year we were finishing up our brand new bar (within a bar), and putting the finishing touches on menu planning with Chantal Tseng and Daniel A Searing Jr. Since then we've been lucky enough to add Carlie Steiner to our lineup, and the rest is history. It's been a great year - come celebrate with us! There will be champagne aplenty, and some of favorite drinks from the last year of menus.